Watcher is the upcoming alerting and notification product for Elasticsearch that lets you take action based on changes in your data. If you can query it, you can alert on it. Simply define a condition, a schedule, and the actions to take, and Watcher will do the rest. That's super sweet! 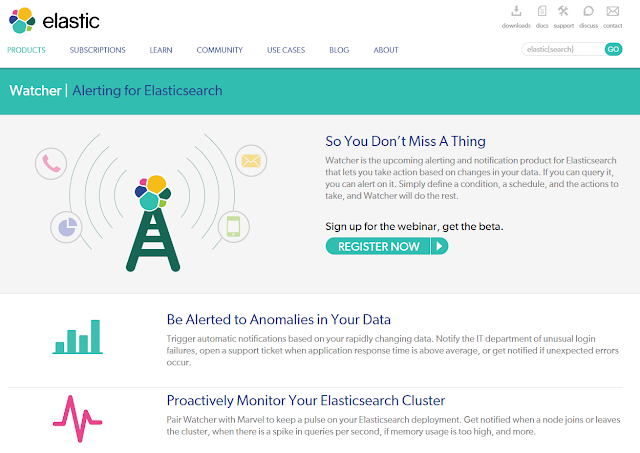 We're using Kibana for monitoring our cloud services, so that's perfect. Indeed we're checking the logs for exceptions and things and we have this arbitrary threshold in mind of the number of exceptions that is 'OK' (caused by transient faults) and when it's 'too much'. I have high expectations that we can get notified in these events by this new watcher feature!